While a lot of talk in the tablet world is about slim, ultra light weight, sleek tablets, first thing I think is how many times will I potentially drop the gadget and will it last a real day in the field. Most tablets automatically get a “no” on that. Sleek means slippery, weight little means it will easily fall out my hands. 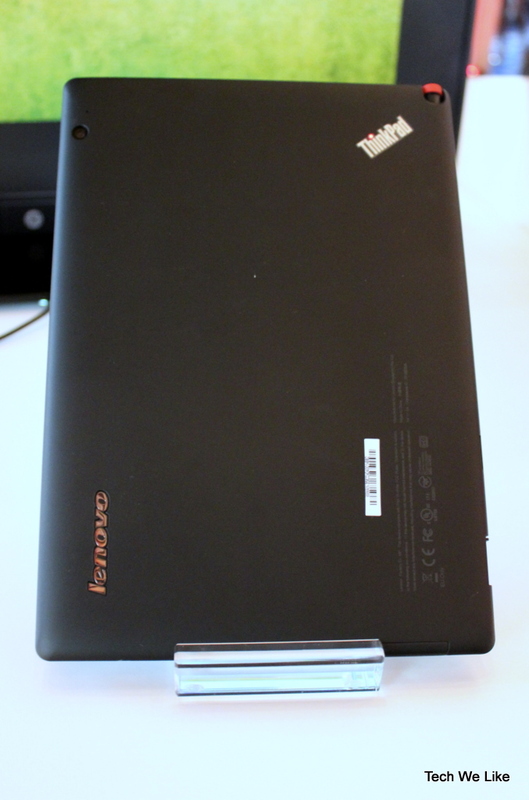 ThinkPad Tablet fixes one issue with a durable rubberized backing. The multi touch display is made with Corning® Gorilla® Glass (said to be pretty unbreakable). 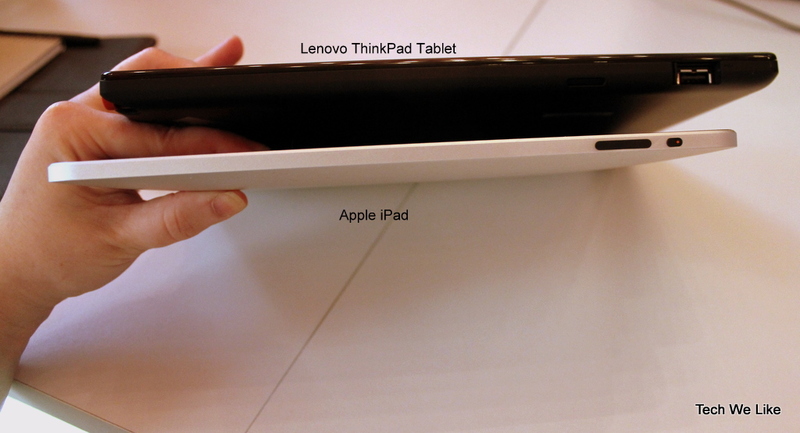 It actually seems close to same size as competitors with 10.1” WXGA (1280×800) 16:10 IPS panel. All black body makes the screen display really pop out at you. Weight is starting at 1.65 lbs (think weight of Motorola Zoom and Toshiba Thrive), making it stable in your hands. 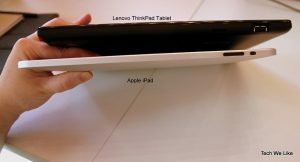 Although the battery doesn’t match up to the two top selling tablets currently out, the company is saying the battery lasts about 8 hours of battery life (with WiFi enabled) when “fully” using all functions. Powered by NVIDIA® Tegra™ 2 Dual-Core 1GHz processor with availability in three models 16gb, 32gb or 64gb each with 1 gb of memory. Currently the model coming out is only wifi enabled, with 3G connection coming out later this year. 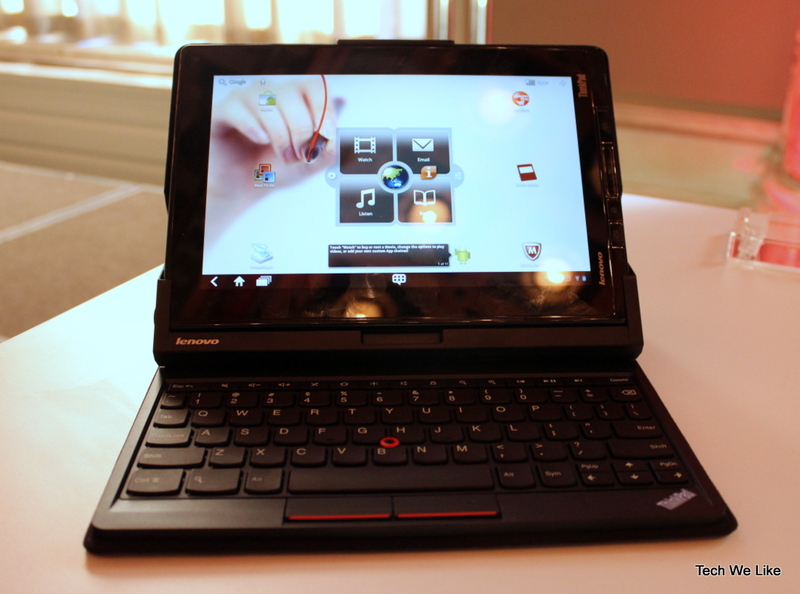 Run on Android 3.1 Honeycomb os, the screen loads quickly with a multitude of customized widgets to organize your apps. Even on a busy wifi connection, full flash pages loaded pretty quickly which caught my attention right away. 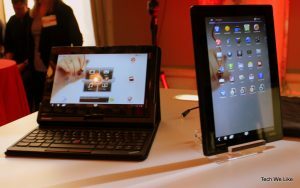 The ThinkPad has two app market places to choose from, the highly secure Lenovo Android App Market (which currently has 250+ apps available) and the standard Android Market. Because Android Market is know for letting some less then secure apps slip through, Lenovo has a higher testing regiment for it’s market. A great market related feature of the tablet is the AppVerse, this function lets you connect with your contacts to see what they’re using and recommending in the app market. Kinda of social media sharing of apps. Want your friend to know how awesome PicPlz is, AppVerse will connect them to your recommendation. I’m hoping in the future to see this function on all Android based tablets to really create community around the apps we use. I look to my friends constantly for recommendations about new Android apps. Just for all the Angry Birds fans out there, it comes preloaded with a version to get you started gaming on your tablet (as well as some other games). For multimedia creation: For multi-media creation, the tablet has two cameras, front facing 2mp for video calls (tablet is pre-loaded with Oovoo app for video conferencing) and rear facing 5mp for still photos and video. The SocialTouch app pulls all your media into one easy to widget. For connection use there is Native USB 2.0 and micro-USB ports, full-size SD card slot and mini-HDMI output. It’s pricing is competitive to iPad 2 and Samsung Galaxy Tab 10.1 as well as related tablets, 16gb starts at $499.00, 32gb at $569.00 and 64gb at $669.00. 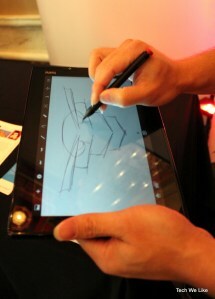 The ThinkPad Tablet Pen is an extra $39.99. Right now only available for ordering online at http://shop.lenovo.com, soon will be available in several national and local technology minded retailers. 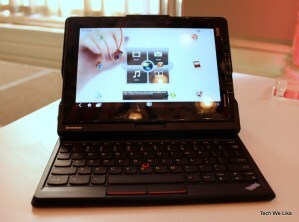 Pictured is ThinkPad Tablet with optional ThinkPad Tablet Keyboard Folio Case ($99.00). As a blogger and freelance marketing/public relations professional as well as busy lady constantly on the go, I am really excited about the possibilities of this tablet and looks forward to taking it on a real “road trip” of testing in my daily life soon. So far just off 3 hour preview event, I give it a 3.5 out of 5 stars (no tablet on the market has gotten a 5 stars from me yet).